Drive down any main street in America and you will undoubtedly pass by at least one, most likely two or three restaurants of the fast food variety. Pushing burgers, tacos, fried chicken and milk shakes, these quick stops have become a familiar source of comfort for travelers far from home and a favorite stop for a late-night snack. 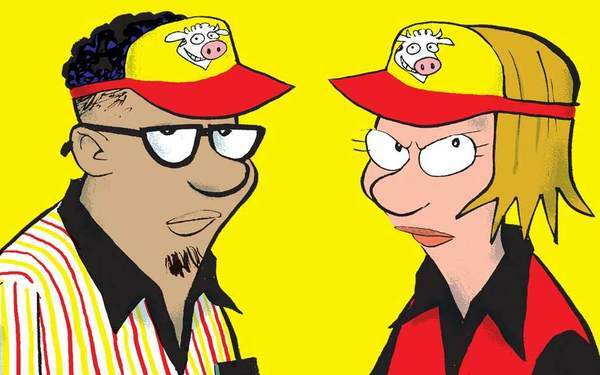 Mark Pett’s LUCKY COW delves into the humor of the fast food, minimum wage experience, as teenagers struggle to balance school, their social lives and working at Lucky Cow and the managers hope to keep major disasters to a minimum during peak business hours. It all adds up to a hilarious combination.